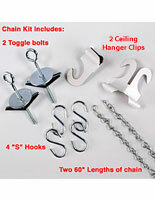 This Sign Supply Is a Complete Promotional Installation Kit! 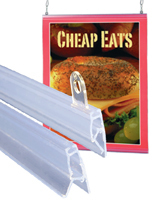 This Discount Sign Supply With Ceiling Mounts Will Produce Mid-Air Company Displays! 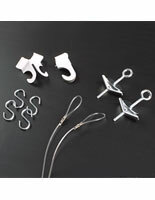 SignSupplies2Go.com Stocks Variations Too! This wholesale sign supply for mounting posters includes installation options for different ceiling types. Use the hanger clips when hanging signs from suspended ceilings. 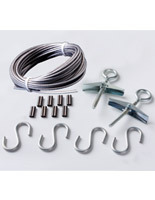 The sign supply kit includes toggle bolts, if your ceilings are made of sheetrock or plaster and lathe. 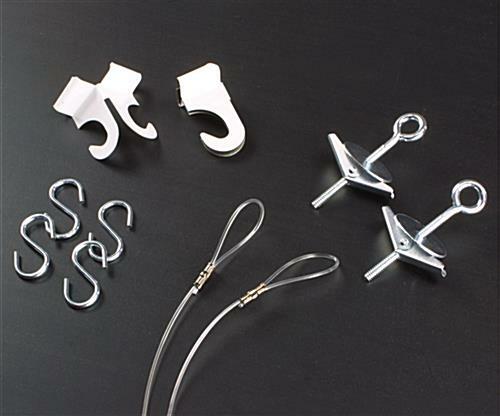 Menu hanging hardware kits give you a space-saving alternative to wall displays, whether they're cheap plastic or heavy metal frames. This sign supply package offers a display method that's easily installed and updated, as well as being an eye-catching marketing technique. Our clientele are increasingly ordering these ceiling mount sets instead of wall frames for their promotional needs, due to the kits' superior capacity for drawing customer attention. Ceiling suspension has the added benefit of freeing up strategic floor and wall locations for other graphics and signs. Big department stores and food market chains rely on this sign supply design for advertising the latest products, or for informing customers of sales events or the store's layout. If you like the concept, but need longer suspension lines to use it at your location, our company sells this kit with other line lengths.